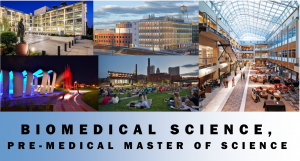 Our Biomedical Sciences Pre-Clinical Post Baccalaureate Master’s specialization is designed for individuals who wish to enhance their academic qualifications and increase their competitiveness for health professional school admissions. As a part of the plan of study, individuals have the option of completing a 12, 18 or 24 month graduate biosciences curriculum which includes optional test preparation training. In order to meet the needs of our applicant pool, we now offer enrollment during the spring semester. Find out more information by downloading our brochures here and here and visit our Admissions page for additional information.